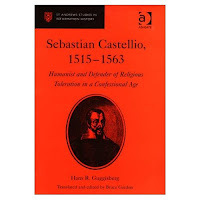 Sebastian Castellio received such a comprehensive education that he was fluent in French, Italian, German, Latin, Hebrew, and Greek when he had finished. Other writers, including Voltaire, wrote and spoke about his magnificent intelligence and keenly trained mind.Though John Calvin was better known perhaps it was considered evident that Sebastian was, at the very least, his intellectual equal if not his superior. He was a faithful Roman Catholic with a vibrant faith and it was because of this faith that he had received his education in the first place--he felt called to use his intellectual gifts in the service of God through the Church. Yet, when he was only twenty-four years old he was in Lyon when the French Inquisition was punishing heretics. They tied the reformers and the heretics to posts and incinerated them for disagreeing. Sebastian was sickened by this and was aware that he could no longer deny that there was something wrong in the Church. If leaders in the Church could consciously destroy others who disagreed with them--could wield a sword made of steel instead of love--then there was something horribly wrong in the Church. Sebastian resolved to be a part of the solution and joined with the reformers. He traveled to Strasbourg where he met John Calvin. John and his wife were so impressed with Sebastian that their relationship bloomed quickly. In 1542 Sebastian was asked to become rector at the College de Geneve and was licensed to preach the Gospel in that area.His theological work was looked upon with charity and esteem not only because of his noted intellect but also because of his friendship with John Calvin. But things began to turn sour as time went on. Perhaps Sebastian's first inkling that things weren't okay was when a great illness swept through Geneva claiming victims. Sebastian went about the work of the Church and offered pastoral care and the last rites to the sick and dying in Geneva. While he was doing this he was informed that this was unusual. When he asked why he was told that Calvin and the other ministers had labeled themselves too important to risk dying to comfort a small part of the Church. In other words, they had decided that their death was more costly than the deaths of unknown Christians. Later Sebastian went to John to received his endorsement for a translation of the New Testament into French that Sebastian had penned. John denied Sebastian's request because John's cousin had recently asked for the same thing. The pain was not in the denial or rejection but the stinging and mocking words that John offered to Sebastian. Perhaps the last blow to John and Sebastian's relationship came when Sebastian rose to his feet in a public meeting of ministers to insist that ministers should not persecute or slander those whom they disagreed with. At the heart, Sebastian's suggestion was that lay people be considered as important as the clergy and that clergy not abuse power simply because it was within their grasp. This idea--not persecuting those whom you disagreed with--was deep seated with Sebastian and would become a point of contention with many throughout his life. When Sebastian saw John and his friends mock and deride somebody they disagreed with he could smell the smoke in Lyon all over again. For this insistence he was charged with "undermining the prestige of the clergy" and removed from his position. His license was cancelled and he was turned out of his home. He and his family were abandoned by a group of religious leaders who had given up reformation for a new power structure with themselves at the top. Sebastian and his family struggled for years until he eventually found work again as professor at the University of Basel. Meanwhile, in Geneva, a doctor and theologian by the name of Michael Servetus was being tried for heresy and blasphemy by John Calvin's power structure. Michael had denied the trinity among other teachings and was ordered to change his mind to agree with John. John Calvin even inserted himself among the judges at work in Michael's conviction. When Michael refused to recant he was burned at the stake in Geneva. When Sebastian heard of this he began writing articles and letters to alert the general population of the blood that dripped off of John Calvin's hands--the blood of Michael Servetus. Though he never claimed Michael to be orthodox in his theology he did insist that his heresy should have been rebuffed by reason and rhetoric and not shackles and flames. Further, he disagreed with John's definition of heresy as "anybody who disagrees with me on a theological point." Rather, he insisted that there was room for liberty within the bonds of the Church--or at the very least there was room if there was any hope for reformation. Sebastian was successful in convincing some but yet more remained in support of John Calvin's ruthless theological efficiency. Before he died (and his enemies dug up his body and burned it), he wrote: "We can live together peacefully only when we control our intolerance. Even though there will always be differences of opinion from time to time, we can at any rate come to general understandings, can love one another, and can enter the bonds of peace, pending the day when we shall attain unity of faith."